This lesson will walk you through clearing your Flash Player Cache. This cache is similar to Temporary Internet Files and like Temporary Internet Files may need to be cleared occasionally, especially following new releases of an Attainia application. Once you visit the website again, the application files will be downloaded again. Read each step thoroughly before performing the step. Begin by clicking on this link, Flash Player Settings Manager. You should be at Website Storage Settings Panel. If not, on the left under TABLE OF CONTENTS click on Website Storage Settings Panel. Click on the Delete all sites button. 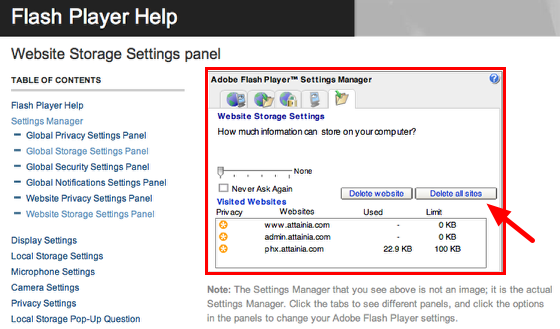 This will remove Flash Player Cache, enabling the latest application files to download on your next visit to Attainia. When prompted click the Confirm button to confirm the delete action. Reopen a new browser and go to www.attainia.com. Login and launch the application. When prompted for Local Storage, click Allow button.